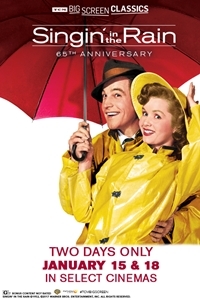 Fathom Events, Turner Classic Movies and Warner Bros. Entertainment are celebrating the 65th Anniversary of Singin' in the Rain and bringing the iconic movie to select cinemas nationwide for a special two-day event which also includes a special introduction from TCM Host Ben Mankiewicz. Musician Don Lockwood (Kelly) rises to stardom during Hollywood's silent-movie era--paired with the beautiful, jealous and dumb Lina Lamont (Jean Hagen). When Lockwood becomes attracted to young studio singer Kathy Selden (Reynolds), Lamont has her fired. But with the introduction of talking pictures, audiences laugh when they hear Lina Lockwood speak for the first time--and the studio uses Selden to dub her voice.